Trichocereus pachanoi f. mostruosa hort. Cereus pachanoi (Britton & Rose) Werderm. in Backeb. Echinopsis pachanoi f. cristata aurea hort. Trichocereus pachanoi f. cristata aurea hort. Echinopsis pachanoi f. cristata hort. Trichocereus pachanoi f. cristata hort. Echinopsis pachanoi f. quadricostatus hort. Trichocereus pachanoi f. quadricostatus hort. Monstrous form: In cultivation it is possible to find several monstrous clones of variable shape and size, the one here described, “cv. Gianfra” , has irregularly arranged ribs often divided in bumps, and can also get very big making a spectacular specimen. In all other characteristics it is very similar to the standard species with several branches, usually extending from the base. Stem: Upright columnar and flexible 6-15 cm in diameter, pale green to blue-green, slightly glaucous when young, dark green in age. Ribs: 4-8 irregularly truncated, or branched , obtuse, rounded, with a deep horizontal depression above the areoles. Spines: Few (3 to 7) very short , unequal 1-4 mm long, dark yellow to light brown. Spines are located at the nodes which are spaced evenly (approximately 2 cm apart) along the ribs. Flowers and fruits: Not seen. Echinopsis pachanoi (Britton & Rose) H.Friedrich & G.D.Rowley: Large, multi-stemmed columnar cactus. Forms a small tree 3 to 6 meters tall by 1,8 m spread, with several upright pale green to blue-greenbranches, usually extending from the base. Echinopsis pachanoi f. cristata aurea hort. : has canary-yellow to golden-yellow crestes stems. Echinopsis pachanoi f. cristata hort. : It is a quick grower like-brain looking plant, the growing point is generally ridge-like instead of circular. The crested form can also get very big making a spectacular specimen. Echinopsis pachanoi f. monstruosa cv. Gianfra: has irregularly arranged ribs often divided in bumps. Echinopsis pachanoi f. quadricostatus hort. : has only 4 ribs. 2) Ostalaza, C., Cáceres, F. & Roque, J. 2013. Echinopsis pachanoi. In: IUCN 2013. "IUCN Red List of Threatened Species". Version 2013.2. <www.iucnredlist.org>. Downloaded on 29 March 2014. 7)Dobkin de Rios, M. “Trichocereus Pachanoi: a Mescaline Cactus Used in Folk Healing in Peru.” Economic Botany 22 (1968): 191–194. 8) Cordy-Collins, A. “Psychoactive Painted Peruvian Plants.” in: Journal of Ethnobiology 2, no. 2 (1982): 144–153. 9) Torres, D., and M. “San Pedro in the Pressure Pot.” Yearbook for Ethnomedicine and the Study of Consciousness 1995, no. 4 (1996): 283–284. 10) Davis, E.W. “Sacred Plants of the San Pedro Cult.” Botanical Museum Leaflets 29, no. 4 (1983): 367–386. 11) Hofmann, A., Ratsch, C., Schultes, R., “Plants of the Gods: Their Sacred, Healing, and Hallucinogenic Powers.” Rochester: Healing Arts Press, 1992. 12) Furst, P.T. “Shamanism, Transformation, and Olmec Art.” In The Olmec World: Ritual and Rulership. Princeton, N.J.: The Art Museum, Princeton University, 1996. 13) Polia, M., and A. Bianchi. 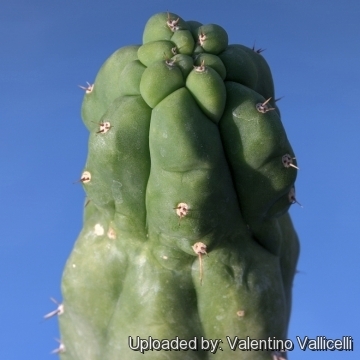 “Ethnological Evidences and Cultural Patterns of the Use of Trichocereus Pachanoi Britt. Et Rose Among Peruvian Curanderos.” Integration 1 (1991): 65–70. 14) Ratsch, Christian., “The Encyclopedia of Psychoactive Plants: Ethnopharmacology and its Applications.” Rochester: Park Street Press, 1998. 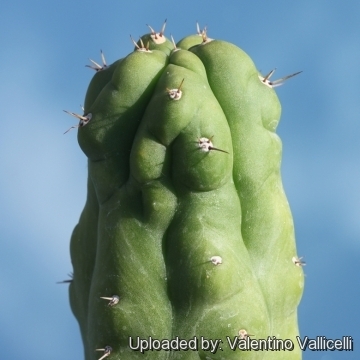 Cultivation and Propagation: Trichocereus pachanoi is very easy to grow and cold hardy. Growth Rate: It produces good amounts of growth each year if kept well fed and watered throughout the warmest months, particularly if it has been acclimatised to accept full sun. Soils: It needs a fertile, well drained soil mix. Watering: Water the plants well and allow them to dry before watering again. This species seems to do better with a little more water than most cacti. In fact, its cultivation requirements are really more like 'normal' plants than most other cacti, keep dry in winter or when night temperatures remain below 10° C. Water it less than average if in bigger pots. 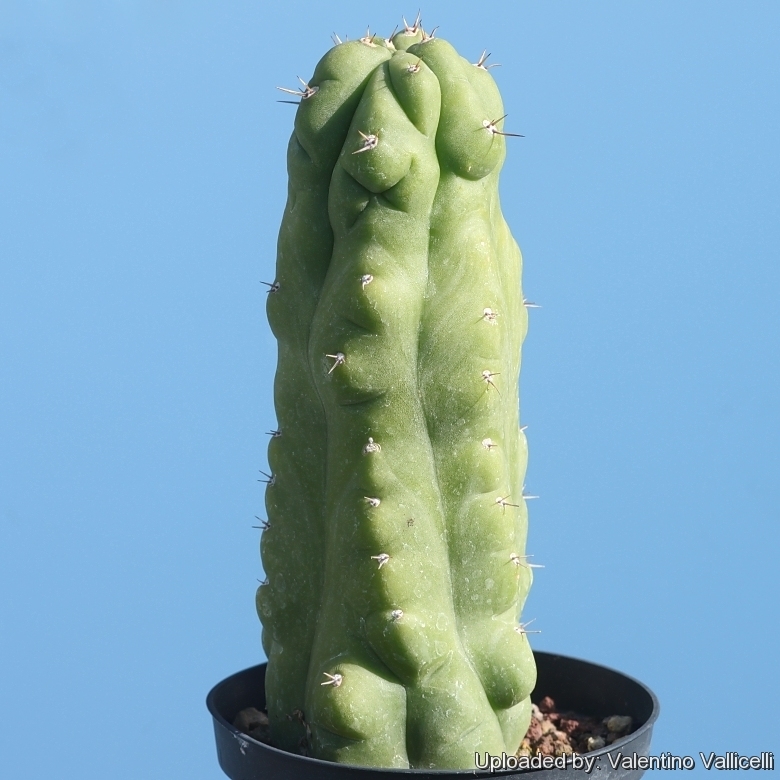 Hardiness: Trichocereus pachanoi is very easy to grow and cold hardy as low as -12°C (or less). Assure a good ventilation. 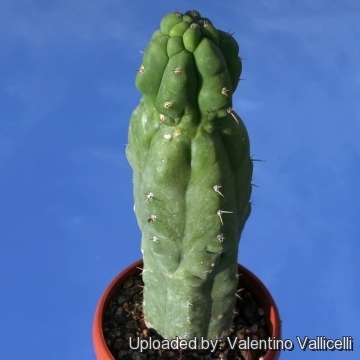 Exposition: Outside full sun, but during hot summers the cactus are subject to sun burning, so grow them in light shade. Inside they need bright light, and some direct sun. During winter months, put them in a cool luminous place and encourage them to enter winter dormancy by withholding water and fertiliser over the winter, as they will etiolate, or become thin, due to lower levels of light..
Pests & diseases: They are susceptible to fungal diseases if over-watered, but are not nearly as sensitive as many other cacti, especially in warm weather. They tend characteristically towards black rotted spots unless watering is moderate and only in hot weather. If kept damp through cold periods, they will invariably suffer. Propagation: From seed or usually cuttings. Seeds germinate in 7-14 days at 21-27° C in spring, remove the glass cover gradually as the plants develops and keep ventilated, no full sun for young plants!